Have Your Made Your Easter RSVP? 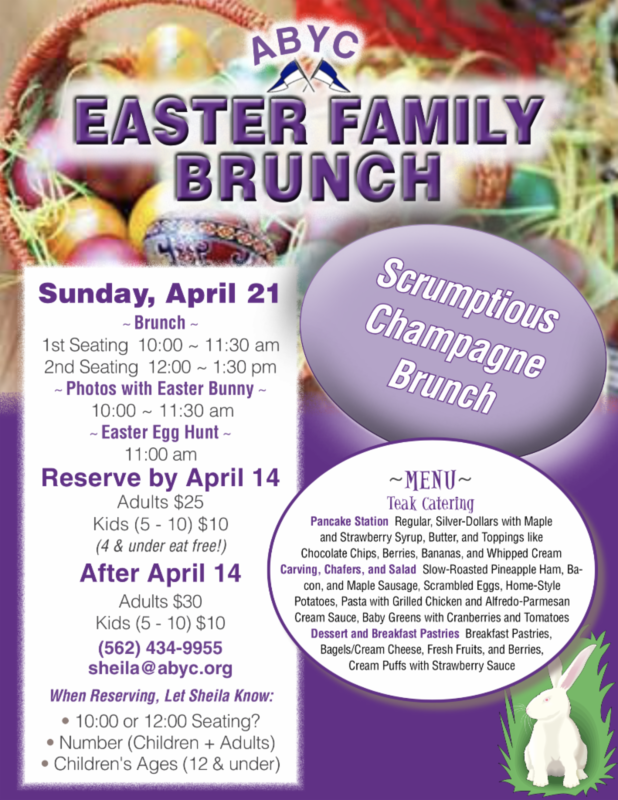 CISA Clinic, Spring Spruce Up ... Then Easter Brunch! As you all may have heard, CISA Clinic starts today . Lots of bodies and boats moving in all sorts of directions. Simply said ... Things get busy around the club during this event! So please note, that if you're coming down to ABYC, be prepared for limited parking and lots of activity. Here's our " 2019 SPRUCE UP TO DO LIST "! We are quite busy taking reservation for Easter Brunch . The updated flyer is included below in this email. Prices go up after April 14th , so give a shout out to Sheila prior to that date. Brunch by Teak Catering looks mouthwatering, as always! SAC Team goes all out with this event. Make sure you make your RSVP's in plenty of time. We have Opening Day on May 4th ... see Chuck Clay 's article below for details. Raft Up, May 3rd , is being organized by our beloved Jon Robinson . 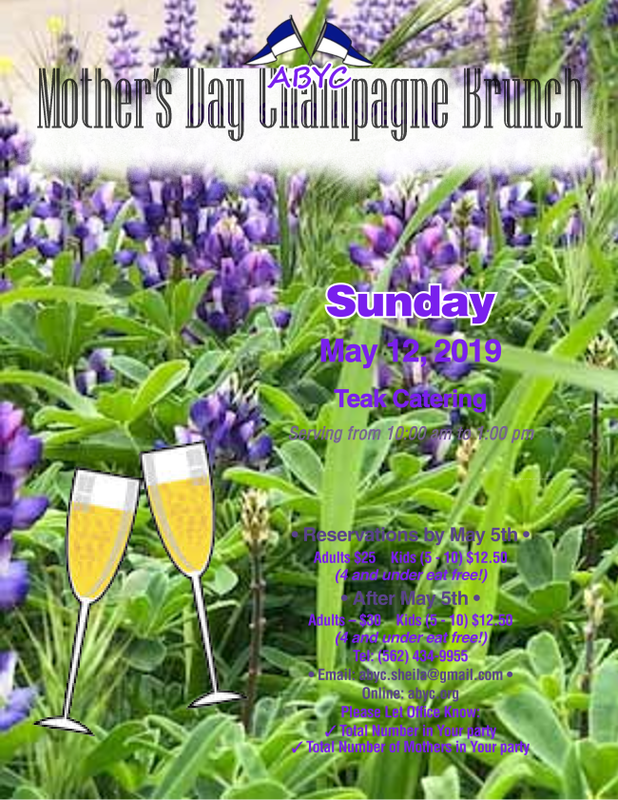 Also mark your calendar for Mother's Day Brunch on May 12th at 10am . Flyer is below as well. Save the date! Dana Bell and our SAC love putting this shindig together. Let's fill the 2nd Deck with our favorite ladies! 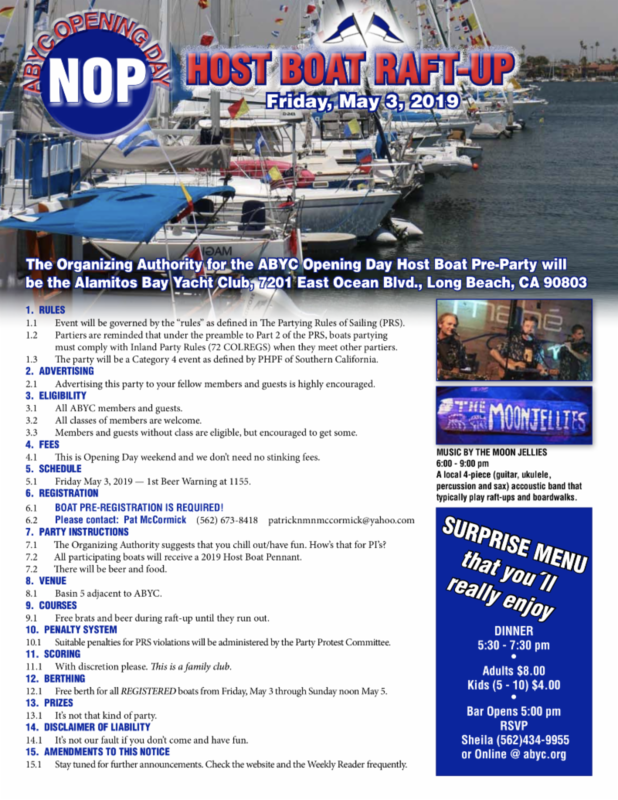 It's that time of the year to officially open up the club and welcome the yachting community to visit ABYC for the 93rd Opening Day Ceremonies. 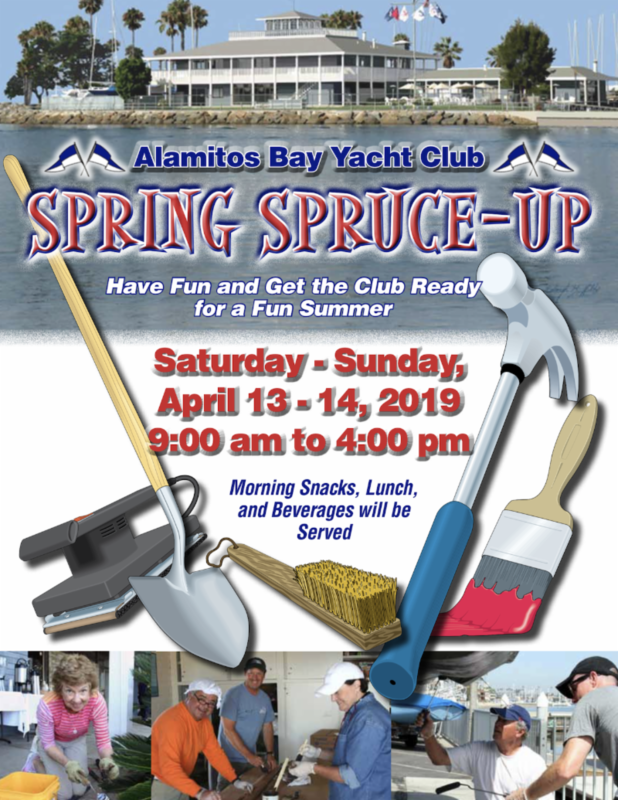 I am sure you are planning on attending our Opening Day Raft-up Party and 93rd Opening Day of Alamitos Bay Yacht Club. 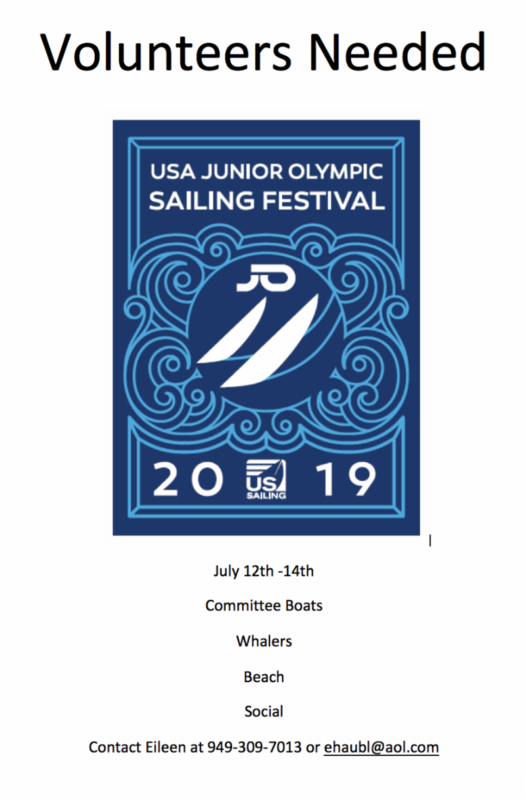 It is one of the great things that we do at ABYC and it is my pleasure to invite you! Here are the details so that there is no confusion and you will get the importance of this “not to be missed event”! Friday May 3rd is the Raft-up Party. All members are invited to raft up! At noon our esteemed Commodore (or justifiably appointed dignitary), will ignite a signal and the day will begin. Boats will start to arrive. If you have a bigger boat, you are encouraged to raft up in Basin 5 and add to the excitement. If you have a dingy or other craft you have the option to display on the hard. We celebrate the diversity of our sailing vehicles! 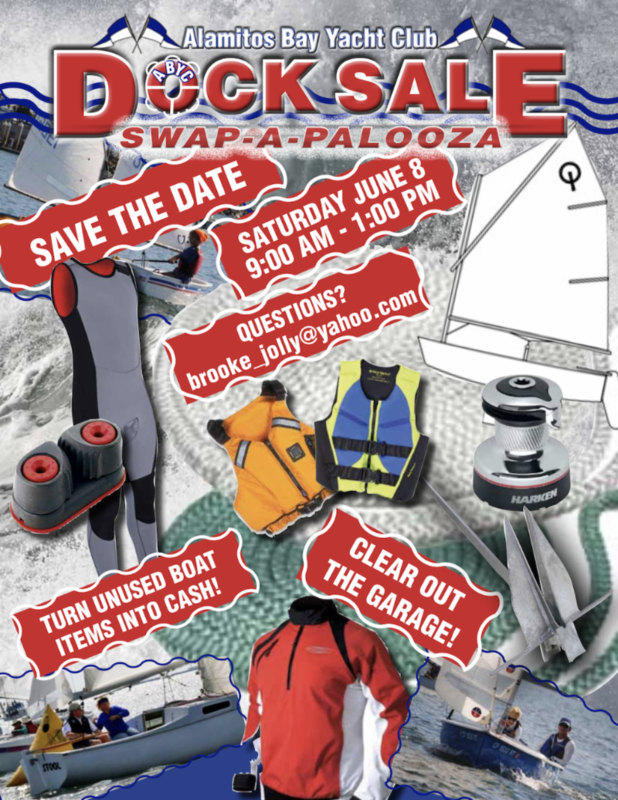 If you want to bring your boat to the raft up, please email Jon Robinson at: sanilex@verizon.net. May 4th is Opening Day. 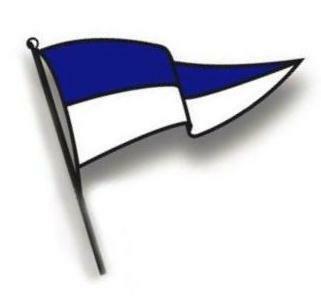 The Club Championship Regatta will be held at 1100. Come to cheer your fleet champion in our sail-off. The winner gets bragging rights and the always coveted parking spot. Open Boat Hospitality will begin at 1300, and the ceremony begins at 1530. The ceremony makes it official! We will introduce your Flags, Board of Directors, some truly magnificent Dignitaries, senior and junior members. This event is to the point! The 30-minute rule will be in effect and promoted! It is encouraged, but definitely not mandatory (in fact, many get away with just being comfortable), to wear our dress attire consisting of a blue blazer with ABYC patch, light blue shirt, ABYC tie, white pants, and appropriate shoes. Please join us for the 93rd Opening Day Celebration and come prepared to have an amazing time!